This main street of the capital city was first mentioned in documents dating back to the 16th century, but it was only towards the end of the 19th century that Calea Victoriei took its present shape and look. Fortunately almost untouched by the large-scale demolition and reconstruction program of the Communist era, Calea Victoriei ribbons between Victoriei Square in the North and Dambovita quay to the South (Natiunile Unite Square – United Nations Square). The oldest part of Calea Victoriei is the current segment between the Revolution Square and the Victoriei Square, which used to be outside the city and which, even before the Brancoveanu era, was a part of the road towards Brasov. The southern part of the street has its roots in the times of Constantin Brancoveanu (1688-1714). It was opened in 1692 to connect the ruler's children house located on the left side of Dambovita, to his residence in Mogosoaia, where he built the charming Mogosoaia Palace still standing today. To achieve this goal Brancoveanu demolished almost everything standing in his way. The road was initially called the Big Lane to Sarindar (Ulita Mare spre Sarindar) after the name of a monastery built in 1652 on the premises of the current Military House (Cercul Militar) at the intersection between Calea Victoriei and Elisabeta Boulevard. As streets were paved with tree trunks during that time (cubical stone pavement was introduced only in 1824), the street floor looked like a bridge so the original name was Mogosoaiei Bridge (Podul Mogosoaiei). The name sticked and lived until 1877, when it was changed into Calea Victoriei (Victory Avenue) as this was the street welcoming the Romanian troops triumphant in the Independence War (1877-1878). Starting with the 18th Century, Calea Victoriei became an area sought after by many wealthy nobleman (locally known as “boyar”) families and merchants, who have built houses in the area. It is one of the first streets in the city which has seen the European modernization. The last half of the 19th century brought modern buildings, such as the Post Palace (Palatul Postelor), the Savings House (the current Romanian Savings House – CEC building), passages Mecca and Villacrosse and several hotels: High Life, Imperial, Splendid, Capsa, Hotel de France, Hotel Louvru, Grand Hotel du Boulevard, Hotel Hugues. Several palaces were also built along Calea Victoriei: Stirbey, Cantacuzino, Sturdza (demolished in the early days of WWII) and the Royal Palace. 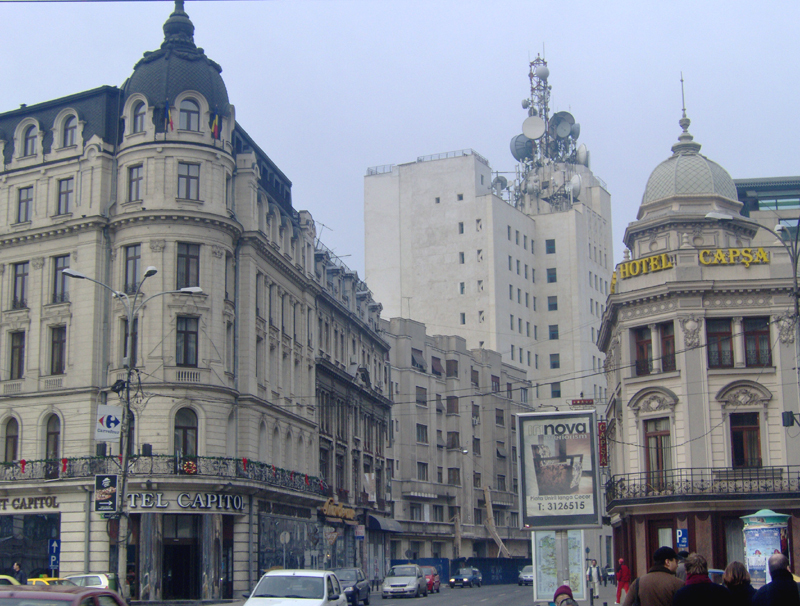 Next week we will write about several historical buildings along Calea Victoriei. Track: Hotelul Intercontinental — strada Biserica Enei — strada Academiei — B-dul Regina Elisabeta — Calea Victoriei — Piaţa Revoluţiei — strada Boteanu — strada C. A. Rosetti — strada Ştirbei Vodă — strada Spiru Haret — strada General Berthelot — Calea Victoriei — strada Biserica Amzei — strada Christian Tell — strada Henri Coandă — strada Nicolae Iorga — Calea Victoriei — strada General Gh. Manu — Strada Orlando — Calea Victoriei — B-dul Lascăr Catargiu — Piaţa Romană — B-dul Magheru — strada Tache Ionescu — Piaţa Alexandru Lahovary — strada Dionisie Lupu — strada Pitar Moş — strada C. A. Rosetti — B-dul Nicolae Bălcescu — Hotel Intercontinental.